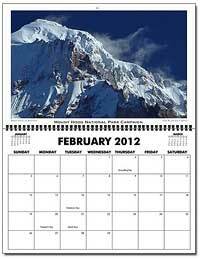 Each year at about this time I assemble the Mount Hood National Park Scenic Calendar. 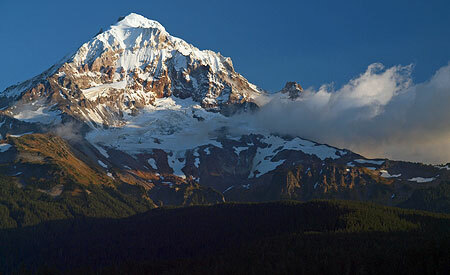 The proceeds are modest, but do help support the Mount Hood National Park Campaign website and related project expenses. The main purpose is simply to promote the project, and make the case for the campaign with pictures. I’ve published the calendars since 2004, and the photos in each calendar are from trips and trails I’ve explored in the previous year. Thus, the 2012 calendar features photos I’ve taken on my weekly outings throughout 2011. I get a surprising number of questions about the photos, so in addition to simply announcing the 2012 calendar, I thought I would dedicate this article to the story behind the images. 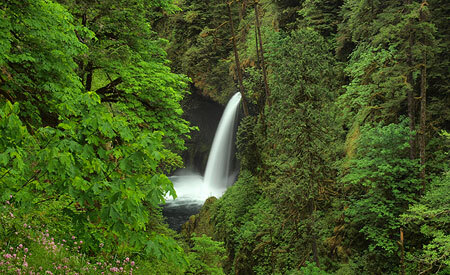 The cover image for the 2012 calendar is a world-class favorite: Punchbowl Falls on Eagle Creek (below), one of our iconic local scenes that is recognized around the world. The Eagle Creek trail is busy year-round, so I picked a Wednesday morning in June to slip in between the crowds, and had Punchbowl Falls to myself for nearly an hour. In spring, this view requires wet feet — or waders — to shoot, as I was standing in about a foot of water and 30 feet from the stream bank to capture this image. I chose wet feet over waders, and to say they were numb afterward would be an understatement! For the January calendar image, I picked this view (below) of the southeast face of Mount Hood, as seen from the slopes of Gunsight Butte. This was taken on a very cold afternoon last January on a snowshoe trip in the Pocket Creek area. This image benefited from some Photoshop editing, as I removed my own boot prints from the otherwise pristine snow in the foreground! I try to reflect the seasons with the monthly photos as best I can, but the February image (below) of the Sandy Headwall in the new calendar is an example where the scene could be in mid-winter, but was really captured just a few days ago, with the first blanket of snow transforming the summit of Mount Hood. This close-up photo was taken from the slopes of Bald Mountain, near Lolo Pass on a brilliant autumn afternoon. It features a new camera toy I picked up this year, too — a 70-300mm telephoto lens that replaced my older, less powerful version. 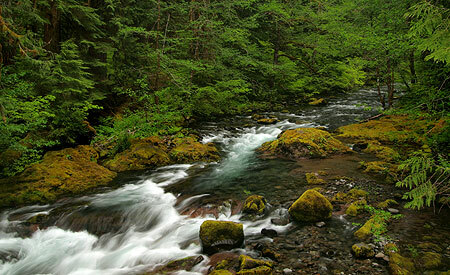 For March, the calendar image (below) is from a June hike along the Hot Springs Fork of the Collawash River. The stream is known to many (incorrectly) as “Bagby Creek”, as it is home to the historic guard station and rustic bath houses at Bagby Hot Springs. The Bagby area has been in the news this year because of an ill-conceived and controversial Forest Service plan to privatize the operations, but I hiked the trail for the beauty of the stream, itself. It’s a beautiful forest hike through old-growth forests and past lovely stream views, albeit very well traveled by the hordes of hot-spring seekers! The April calendar scene (below) is one that few will ever see in person, as it features an off-trail view across little-known Brooks Meadow, on the high slopes of Lookout Mountain, east of Mount Hood. The day was especially memorable for the wildlife all around me as I shot the scene — elk bugling in the forest margins, hummingbirds moving through the acres of wildflowers and several hawks prowling the meadow from the big trees that surround it. I featured Brooks Meadow in this article earlier this year, and was later disappointed to see closure signs posted at the public access points. So, until the policy changes, this view is officially off-limits to the public. 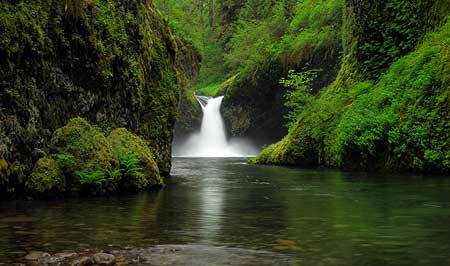 For the month of May, I picked a much-photographed view of Metlako Falls from along the Eagle Creek Trail (below). 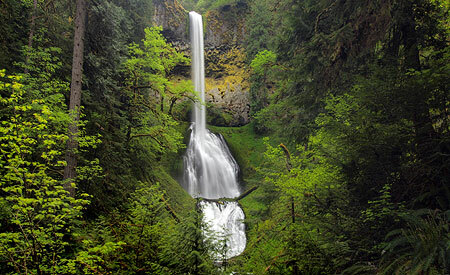 This view was captured on the same day as the Punchbowl Falls scene on the calendar cover. A little secret among photographers is that a clean shot of Metlako Falls requires you to plant at least one foot on the scary side of the cable fence that otherwise keeps hikers from slipping over a 200 foot cliff. It’s perfectly safe… as long as you don’t fall! My main goal was to capture the scene with the spring flowers that appear in the lower left, something I’d admired in other photos. 2011 was a wet year with a persistent snowpack in the Oregon high country, so June hiking was still focused on the lowlands, and especially on waterfalls, which benefited from the runoff. In early June, I made a trip along the Clackamas River Trail to beautiful Pup Creek Falls (below), an impressive, lesser-known cascade tucked into a hidden side canyon, just off the main stem of the Clackamas. I profiled the hike in this WyEast Blog article. 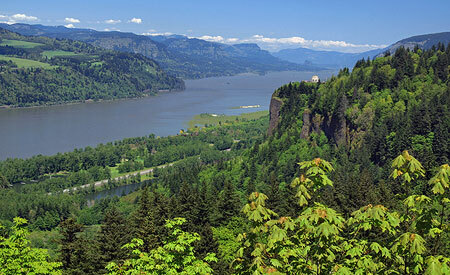 For July, the scene is another familiar view — the sweeping panorama of Crown Point and the Columbia Gorge from Chanticleer Point, at Women’s Forum State Park (below). 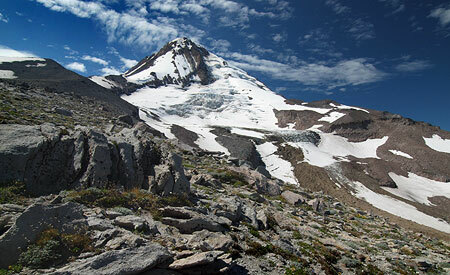 In a typical year, this might have been a day for hiking in the mountains, but in 2011, the lingering snowpack persisted until the end of July. This image shows the resulting swollen, flooded Columbia, with spring levels of runoff continuing well into the summer. The high country trails finally opened in early August, and I followed one of my summer rituals with a hike to Cooper Spur, high above Cloud Cap Inn on the east slopes of Mount Hood. This view (below) is from the south Eliot Glacier moraine, just below the spur. I profiled a proposal for improving the Cooper Spur trail in this WyEast Blog article. Not visible at this scale are the ice climbers who were exploring the lower Eliot Glacier icefall that day, in the right center of the photo. In September I was doing research on historic Silcox Hut, located about a mile and a thousand vertical feet above Timberline Lodge. The venerable structure was built in 1939 by the Works Progress Administration for a mere $80,000, and served for many years as the upper terminal of the original Magic Mile chairlift. 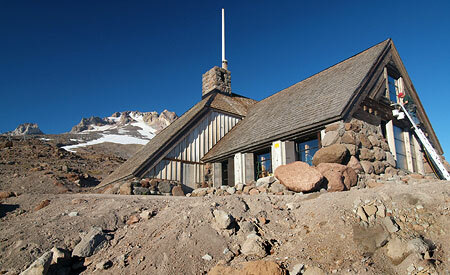 The Friends of Silcox Hut restored the structure in the 1980s, and it was reopened for overnight guests in 1994. Though I rarely include man-made structures in the calendar, this view of Silcox Hut (below) shows how the structure seems to rise up as part of the mountain, itself, in a triumph in architectural design. The worker on the ladder is part of a 2011 American Recovery and Reinvestment Act (ARRA) project to further restore the building for generations to come. In October, I usually scramble to capture early fall foliage images for the calendar. Mount Hood and a group of vine maples obliged this year in this view from Lolo Pass Road (below), captured just a few days ago on a beautiful Indian Summer day. The November calendar scene (below) is from Lolo Pass, proper, taken in late October on a crisp evening just before sunset. The scene includes all of the ingredients that make autumn on Mount Hood so rewarding for photographers: the first blanket of snow had fallen at the highest elevations, while the meadows above timberline have turned to shades of read and gold. 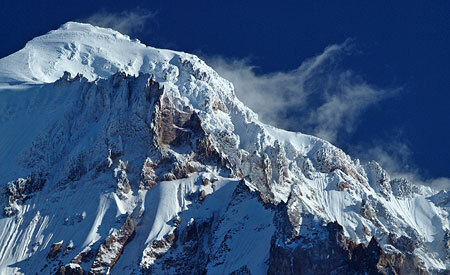 The mountain, itself, is wrapped in swirling autumn clouds. Spectacular! 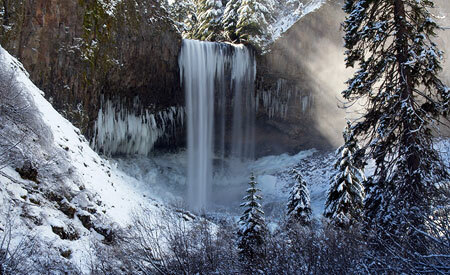 The final image in the new calendar is of Tamanawas Falls in winter (below). The falls are located on Cold Spring Creek, a major tributary to the East Fork Hood River, and this scene was captured last January while on a hike with an old friend visiting from Nevada. In this scene, rays of intermittent sunshine were lightening up mist from the falls, creating what can only be described as a “winter wonderland”! The hike to Tamanawas Falls is described in this 2008 WyEast Blog article. 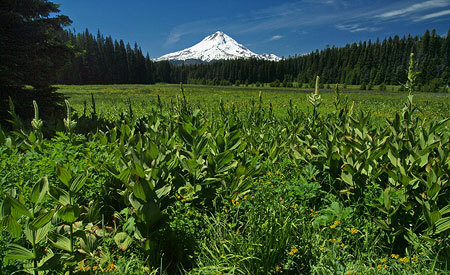 The thirteen images I chose for the 2012 Mount Hood National Park Calendar were narrowed from 117 images that I had set aside over the course of 2011. 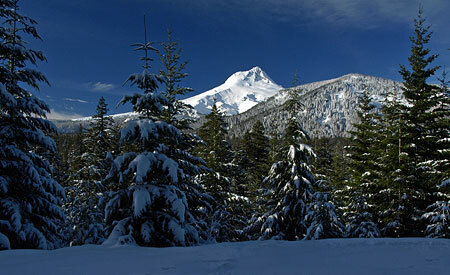 These were the “best” of several thousand images taken on something upward of 50 outings to Mount Hood and the Gorge. As always, these adventures took me to new places and discoveries, as well as my old haunts. And as always, the magnificent scenery further confirmed my conviction that Mount Hood should be set aside as our next National Park! Hopefully, the calendar makes that case, as well. 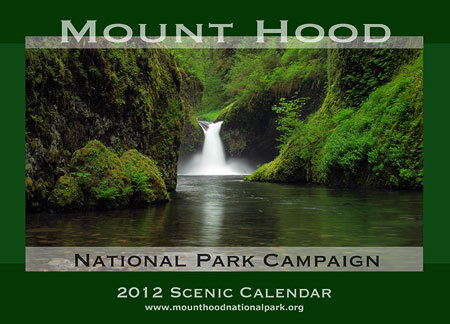 The 2012 calendars are available now at the Mount Hood National Park Campaign store. They are large and functional, measuring 17” across by 22” tall, with plenty of room for writing notes and scheduling activities. 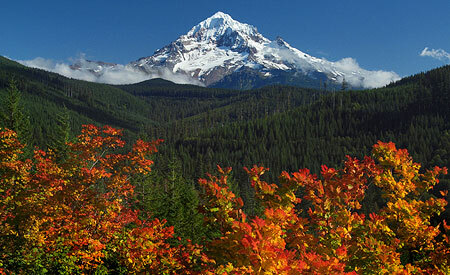 They sell for $24.99, with about 25% of the proceeds going to support the Mount Hood National Park Campaign. This entry was posted on October 30, 2011 at 4:04 pm and is filed under Blog News, Photography. You can subscribe via RSS 2.0 feed to this post's comments.